Museum Dedicated to "Mr. Awesome"
The spirit of an "awesome" 7-year-old South Florida boy who died in a tragic swimming pool accident last year lives on in of his favorite places: the Miami Children's Museum. A newly renovated exhibit displaying the inner workings of the Port of Miami has been officially renamed the "C&C Crane Company" after the late Calder Sloan and his brother, Caleb. Calder would have been 8-years-old this year. His father, Chris Sloan, says half of his birthday parties were celebrated at the museum. "The very last day he was alive on this earth, he was here playing at that exhibit and loved it," Sloan tells NBC 6 South Florida. A 7-year-old boy who died while swimming in North Miami pool was laid to rest in a memorial service on Friday. NBC 6's Hank Tester has more. The exhibit is the first renovation at the museum, spokesperson Deborah Spiegelman tells NBC 6 South Florida. "We're very excited. The Sloan family is super," Spiegelman says. "The energy, and the two boys really speak to everything the museum is about." Sloan was swimming in a North Miami on April 13 of last year when he was electrocuted and died. Police said the boy may have been electrocuted by a malfunctioning pool light that sent charges through the water. After his death, Calder's "Mr. Awesome" self-portrait went viral, showing up at the AmericanAirlines Arena and Miami-Dade Police headquarters. 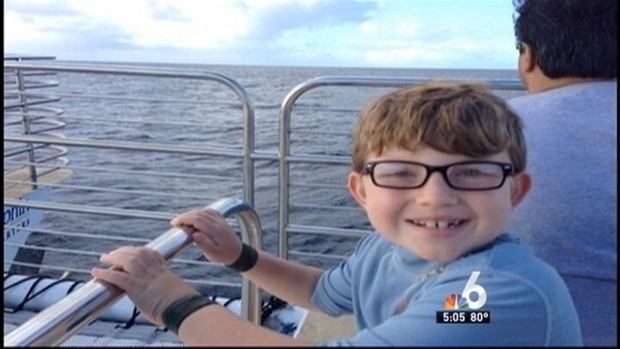 Since the boy's death, Calder's parents have been successful in Broward and Miami-Dade counties in establishing rules to lower the electrical voltage running through pool equipment for new and renovated pools. The family says they've had more difficulty establishing the same rules at the state level. They do have support at the state Senate to create a task force to reform the building codes for pools, push for tougher inspections, and reduce the voltage in pool lining.